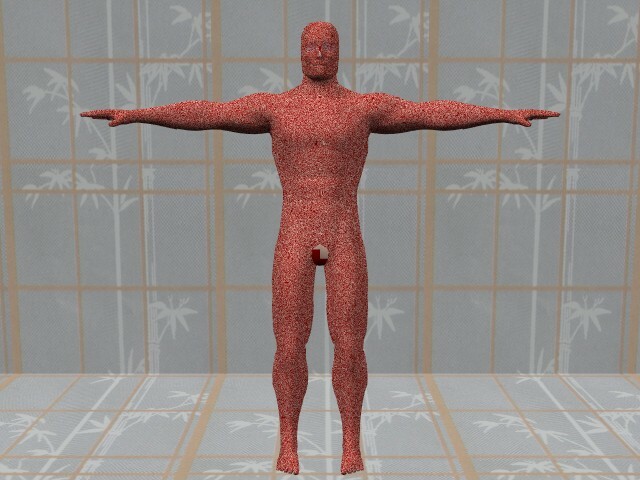 According to Happeh Theory, masturbation will make a human being blind and crippled, as well as causing many other changes to the human body. Some of those other changes are alterations to the location, orientation, and shape of the energy body. that should normally be centered and aligned on the physical body as shown in the following picture. 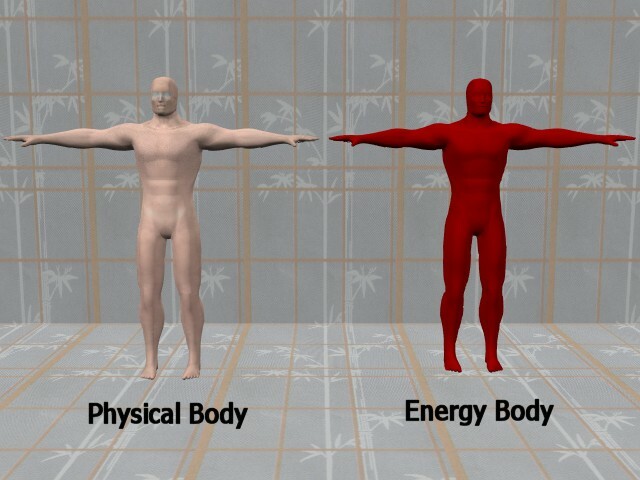 The body appears speckled flesh and red colors because the energy body is superimposed on exactly the same center as the physical body, the energy body is oriented in the exact same way as the physical body is, and the energy body is the exact same size as the physical body. Masturbation will force the energy body away from it’s proper orientation on the physical body. 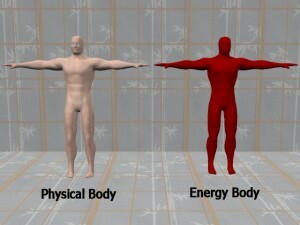 The following picture shows a rotation of the entire energy body to the right to demonstrate the concept of energy body movement. According to Happeh Theory, the energy body of the example individual in the following picture is misaligned from his physical body in a way similar to the previous picture. while his head is facing off to his right. The human body is designed so the head and body face the same direction. Why didn’t the man turn his body to bring his head to bear on whoever he is speaking to, instead of rotating his head while his body remained stationary? 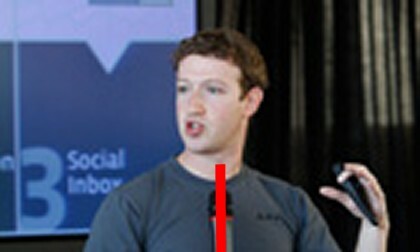 The size and shape of the boundary area between the chest and the shoulders is another indication the example individual’s body has been changed by right hand masturbation. The right side boundary area is larger and deeper than the left side boundary area. The man’s raised upwards left hand is another symptom of the masturbation caused changes to his body. Why is the man lifting his left hand upwards? There is no reason for him to do so. 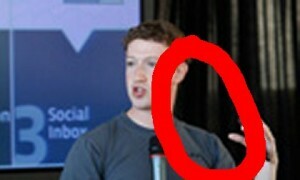 He does not need to raise his left hand in order to speak or turn his head, so why is his left hand raised upwards? His left hand is raised upwards because it has no choice but to raise upwards. 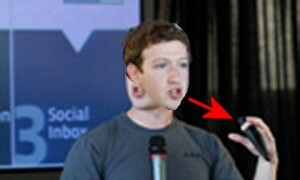 According to Happeh Theory, every part of the human body is interconnected with every other part of the human body. 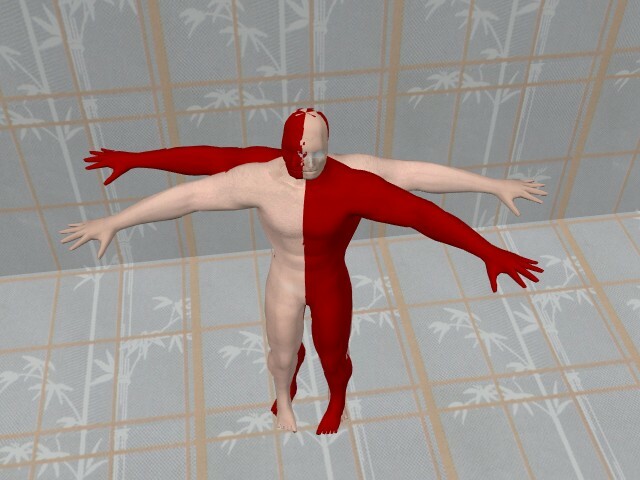 Those connections mean that something that is occurring in the torso or the head can be the cause of some other bodily action such as raising the left hand upwards. Masturbation has shrunken a circular area on the left side of this individual’s body approximately along the path of the circle in the following picture. When the man turns his physical head to his right, the masturbation tightened connection between his head and his left hand pulls his left hand upwards. It is not a coincidence the raised left hand lies on the path of the circle. The left arm and hand are pulled on by the contraction of that circle within the man’s body, so of course they will align themselves along the circle. 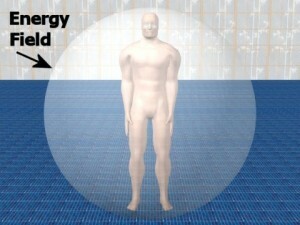 All of those observations of the physical body indicate the head of the individual’s energy body has rotated to the left as demonstrated next. It would not be a surprise if some readers were doubtful there is an energy body associated with the physical body of a human being. Other readers might be doubtful masturbation has any affect on the physical body, or the energy body if such a thing really exists. Still other readers might be doubtful the body of the example individual has been changed by masturbation, even if it is true that masturbation can change the human body. Those readers might feel the example individual’s pose is a completely natural one the man chose to put himself in consciously. Pictures of this nature always provide something that makes most doubting people stop in their tracks and reconsider their doubts. This picture is no exception. Doesn’t it look like the individual’s energy head is speaking directly into the microphone in his left hand? because his energy head feels like it is speaking directly into the microphone his left hand is holding up in front of the mouth of his energy head.